Introducing the Wahoo KICKR Smart Turbo Trainer, the ultimate indoor training experience. The all new silent design, combined with a larger flywheel, makes KICKR the most realistic indoor training experience. 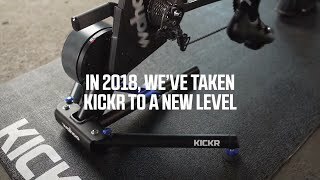 The KICKR provides the very best metrics you need to make sure you are getting the most out of your indoor training, including speed, distance and power, and cadence with the included sensor. Straight out of the box the trainer is ready to take on your gravel, mountain, or road bike to make sure you meet your training needs. Constructed from a heavy-duty frame and high-quality components, the KICKR Smart has the best-in-class precision, stability and durability, serving you for many years to come. And with the KICKR CLIMB, you can experience real ascents and descents while riding along with virtual courses and performing structured workouts, to bring the outdoors, indoors. Simply take the rear wheel off your bike and connect to the Wahoo KICKR for accurate power measurement, controlled resistance, open third-party software options, and you will have the smoothest indoor riding on the market. Pain cave, meet your new best friend. Wahoo's tech gets even better with the KICKR, ANT+ and Bluetooth Smart capabilities allow it to connect to both smartphones and GPS devices simultaneous or separately. An ANT+ FE-C connection allows the KICKR to be controlled from any FE-C enabled device or application, including products like Garmin bike computers. With it's ANT+ and Bluetooth connection, it automatically sets your resistance via your favourite app or software. And finally, the main feature is the ability to simulate up to 20 degree inclines, for tough training to become the next king of the mountains! Giving you a realistic ride feel, the KICKR gives you the ultimate riding experience, serving you for many years to come. Complete the ultimate indoor training setup with the KICKR CLIMB gradient simulator and KICKR HEADWIND smart fan to really bring the outdoors indoors. The Wahoo indoor training ecosystem is a winner of the 2019 Design & Innovation Awards, adding yet another stamp of approval to the most powerful indoor training solution out there. ".